I have a dirty little secret: when pushed to meet deadlines, I stop cleaning up. There was a massive amount of work involved in producing the pieces for Word View. Although it was spread over a period of about three years, the last four months were intensive — working seven days a week, often ten or twelve hours a day. During that time I also met a number of other deadlines. But I did not clean up! 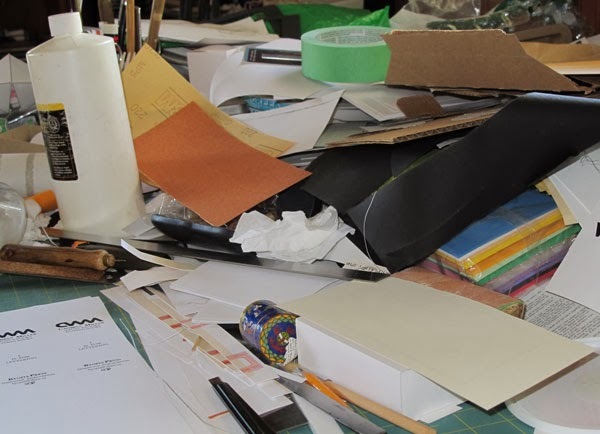 Things got left on the floor or piled on one of my worktables. I am spending this week clearing and sorting and filing and throwing out. 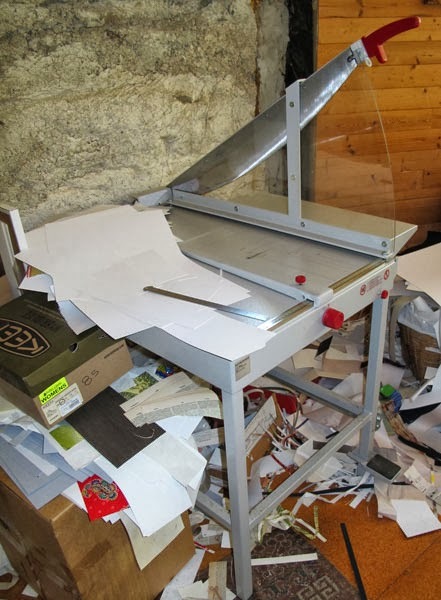 I calculate that it will take about one full workweek to eliminate the incredible mess, but I also estimate that I would have spent at least three times that many hours if I had kept things ‘tidy’ as I went along, hours that I really didn’t have. It takes a certain amount of intestinal fortitude to work in spaces that look like the aftermath of a tornado. It also takes a good memory: I last saw the scissors ... ?! I don’t actually recommend this as a regular approach to the maintenance of a studio space, particularly if you work with potentially hazardous materials, but it has worked for me. Can anyone tell me where I left the shovel? Cathryn's exhibition "Word View" can be seen in the Affinity Gallery from September 27-November 9, 2013. Reception Friday November 8, 7-9pm. The views in this article do not necessarily reflect the views of the Saskatchewan Craft Council. What is the Curatorial Committee?